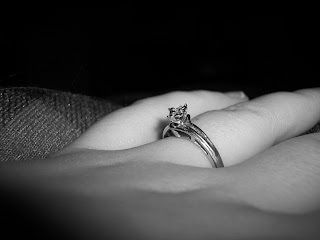 Sorry I am just so excited about having my ring. I still can't believe I have gotten this far in my life. It seems like just yesterday when I started talking to M online, talking to him on the phone, finally meeting him, moving here, and now I am engaged to this great man. Yes, I am still in shock. We have discussed wedding dates and decided on May 27th. Which isn't very long away so I will be very busy making lots of plans, first on my list starting rounding the family together!